A nanopositoner is a highly precise motion device (linear or rotary) capable of positioning samples with nanometer accuracy. Piezo flexure-guided nanopositioners provide the highest precision, aling with compact dimensions and high speed. Linear Motor driven nanopositioners are also available, with air bearings leading in terms of precision and geometric performance . PI has 4 decades of experience in nanopositioner design & manufacture. With more than 1000 employees and R&D and manufacturing on 3 continents, PI is the global leader in nanopositioning systems and piezo stages. There are several ways to design a nanopositioner. Piezo-driven nanopositioners typically provide higher dynamics and precision than traditional motorized stages. For more information on nanopositioning stages click on the examples below, or read the tech blog. An ultra-low-inertia solid-state PZT Nano-Positioner stage can repeatedly move bidirectional nanometer level steps, at up to hundreds of Hz if required. 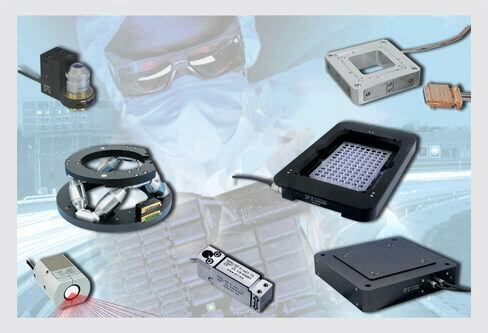 PI offers the largest variety of custom and standard ultra-low inertia nanopositioner systems. positioning Stage. Travel to 800 µm / 10 mrad. 530 page PI Catalog Capacitance sensors are the nanometrology system of choice for the highest precision nanopositioner designs. Single probe capacitive sensors are more versatile and dual probe capacitance sensors ensure higher linearity and longterm stability. These absolute-measuring, non-contact sensors detect motion at sub-nanometer levels directly (direct output metrology) and provide accuracy, linearity, resolution, stability and bandwidth superior to strain gauge type sensors (piezo resistive sensors), LVDT sensors and incremental encoders (glass scale type encoders). If used in parallel-kinematics multi-axis systems, they can also provide the information for automatic runout-compensation. Minimized recoil forces are a by-product of the ultra-low-inertia approach. Classical Micropositioning stages, even when equipped with high-resolution encoders cannot achieve this precision. Their high inertia, friction, and servo dither prevent fast motion at the nanometer level. Jump to the Nanopositioning Selection Guide! Flexure motion is based on the elastic deformation (flexing) of a solid material. Friction and stiction are entirely eliminated, and flexures exhibit high stiffness, load capacity and resistance to shock and vibration. Flexures are maintenance free and not subject to wear. They are vacuum compatible, operate over a wide temperature range and require neither lubricants nor compressed air for operation. Not all flexures are created equal! PI multi-axis nanopositioner systems are based on FEA calculated wire-EDM-cut parallel-kinematics flexure designs. These multilink flexure guiding systems eliminate cosine errors and provide bidirectional flatness and straightness in the nanometer or microradian range. This high precision means that even the most demanding nano-positioning tasks can be run bidirectionally for higher throughput. Wire-EDM cutting process provides highest-accuracy flexure guiding systems in compact nanopositioning piezo stages. PI piezo nanopositioner stages employ the award-winning PICMA® piezo actuators, the only actuators with co-fired ceramic encapsulation. The PIMCA® piezo technology was specifically developed by PI’s piezoceramic division to provide higher performance and lifetime in nanopositioner applications. Multilayer piezo actuators are similar to ceramic capacitors and are not affected by wear and tear. PI nanopositioner systems are designed to be driven at lower voltages than most other piezo systems (100 V vs. 150 V). The research literature, PI’s own test data and 30+ years of experience, all confirm that lower average electric fields lead to longer lifetime. Jump to the Nanopositioner Selection Guide! lers with advanced coordinate transformation algorithms allow active trajectory control for up to 6 DoF. Elliptical scan in a laser micro-drilling application with XY scanning piezo stage, conventional controller. The outer curve describes the target position, the inner curve shows the actual motion of the piezo stage. Preshaping™ algorithms and dynamic digital linearization can increase the dynamic linearity and effective bandwidth of high-speed nanopositioner systems by up to 3 orders of magnitude. This translates into higher dynamic accuracy, and increased throughput. Conventional PID (proportional-integral-derivative) piezo servo-controllers cannot completely eliminate phase lag and tracking errors (the difference between actual and target positions) in dynamic operation. This is due to the nonlinear nature of PZT material, the limited control bandwidth, and the fact that a PID controller needs to see an error before it attempts to correct it. DDL (an option for PI digital controllers such as the E-710) solves this problem. This PI-exclusive technology reduces phase lag and tracking error (the difference between the commanded position and actual position) in dynamic applications to virtually indiscernible levels. The result is an improvement in dynamic linearity and usable bandwidth of up to three orders of magnitude. Dynamic Digital Linearization works both in single-axis and multi axis applications (see graphs). The example above shows ringing of a poorly damped component on a high-speed nanopositioner stage. While the closed-loop piezo nanopositioner stage settles perfectly, the component cannot keep up. Conventional solutions to this problem would involve slowing down the piezo nanopositioner stage. Mach™ eliminates ringing without sacrificing speed. It does not even require retuning of the servo system. The exclusive Mach™ Throughput Processor™ eliminates resonant ringing, allowing rapid motion without a settling phase.This technique also eliminates resonances excited in neighboring components, outside the piezo nanopositioner system's servo loop. The result is significantly increased throughput. The example above shows vibrations induced at the beginning of a saw-tooth scan, typical in image acquisition applications. The vibration results in lower image quality. Mach™ improves the image quailtiy; there is no need to reduce the scanning frequency or chang the mechanical components in the system. Mach™ is available as a firmware option for several PI Digital Piezo Controllers and also as an upgrade option for analog controllers. This technology is protected by one or more of the following US and foreign Patents licensed from Convolve, Inc.: US 4,916,635; US 5,638,267; 0433375 Europe; 067152 Korea, and other Patents pending. Mach™, Throughput Coprocessor™ and NanoAutomation® are trademarks of Polytec PI, Inc. Input Shaping™ is a trademark of Convolve, Inc.
Jump to the Piezo Nanopositioner Selection Guide! Non-symmetric resonant frequencies (lower PZT stage is slower than upper PZT stage, requires different servo settings). Orthogonality error is mounting-angle dependant. Runout in Y cannot be monitored/compensated by the sensor in the X stage or vice versa. Same ultra-low inertia for X and Y motion, providing higher responsiveness and axis-independent performance. Parallel Metrology for reduced runout: X sensor (PI uses non-contact two plate capacitance sensors) can monitor and correct for Y runout and vice versa (Active Trajectory Control). Additional rotation axis (Theta Z) feasible with 3 actuators / sensors and digital controller.